What a COOL way to carry your lunch and a great gift idea for the guy who carries his lunch. 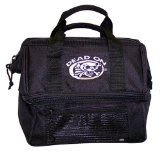 The Dead On Tools DO-300 Killer Chiller Mobile Cooler/Lunch box, Black is a dual insulated lunch box with a compartment for cold and warm storage and an exterior zip mesh accessory pocket. The cooler is 12 inches long by 8.5 inches deep by 10 inches tall, offering a 1,020 cubic inch capacity and is made from waterproof fabric.